Don’t be critical of family members. Fights over wills often have more to do with perceived affronts to relatives than with who gets what. If you do not believe that a particular descendant deserves a share of your estate or you disagree with your partner’s choice of executor, search for a way to present your position without speaking poorly about the person in question. Examples: Explain that you wish to give a particular descendant less than an equal share of your estate not because this person does not deserve the money (even if he/she doesn’t), but because other descendants need the money more or will put it to better use… explain that you are not disagreeing with your partner’s choice of executor or trustee because there is something wrong with this person (even if there is), but because you think that there is someone else even better equipped to handle the task. Propose compromises. Fights are particularly likely when one partner feels his voice is not being heard. Solution: Listen to your partner’s positions, and look for middle ground even if you disagree. Potential compromises if you cannot agree on how to divide up the estate: Leave a ne’er-do-well descendant a family heirloom of sentimental value, but little financial value… establish a charitable trust that provides for the family as one partner wishes, but later donates whatever remains to charity as the other wishes… agree to give a small percentage of the estate to a partner’s children from a former marriage rather than shut these descendants out entirely… include a statement in the will explaining that the descendants who received less are no less loved. 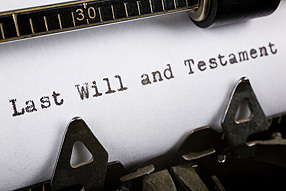 Potential compromises if you and your partner cannot agree on an executor for your will: Name the two candidates for executor as coexecutors rather than selecting one over the other… name a mutual friend or a bank as executor rather than argue over which family member to select. Discuss potentially difficult issues with your partner before meeting with your lawyer. Paying an attorney a steep hourly fee to listen to you argue with your partner will only increase everyone’s tension level. Solution: Sit down with your partner before the meeting to hash out who should be executor… who should be responsible for any minor children… and who should receive what from your estate. Even if you cannot bring every issue to a mutually satisfactory conclusion, this premeeting discussion will allow you to clearly and calmly explain any disagreements to your attorney. Perhaps he can then offer acceptable solutions. Agree on a primary goal. What do you most want your will to accomplish? If you and your partner can agree on this, you are less likely to bicker over details. Example: If you have minor children, you and your partner likely can agree that the main goal of your will is to ensure that they are raised properly. If your partner protests that giving someone on your side of the family custody of the children will anger members of his family, remind your partner of the primary goal and explain why living with your family would be best for the children — perhaps your family lives nearby, so your kids would not be uprooted… or perhaps your sister is your kids’ favorite aunt. Say the words “for now.” Your will can be amended in the future. Reminding your partner that the decisions made today are not necessarily permanent can remove some of the emotion. Example: Your partner believes that a family member with a substance abuse problem will eventually recover and should receive a portion of your estate. To your partner, leaving this family member out of the will is like giving up on him forever. Solution: Agree that this person will be added to the will as soon as he overcomes the problem. Bottom Line/Wealth interviewed Wynne A. Whitman, Esq., a partner specializing in trusts and estates with the Morristown, New Jersey, law firm Schenck, Price, Smith & King LLP. She is author of several books on estate planning, including the upcoming Smart Women Protect Their Assets (FT).